Skip the line for Florence’s most in-demand experience – the Florence Duomo climb. 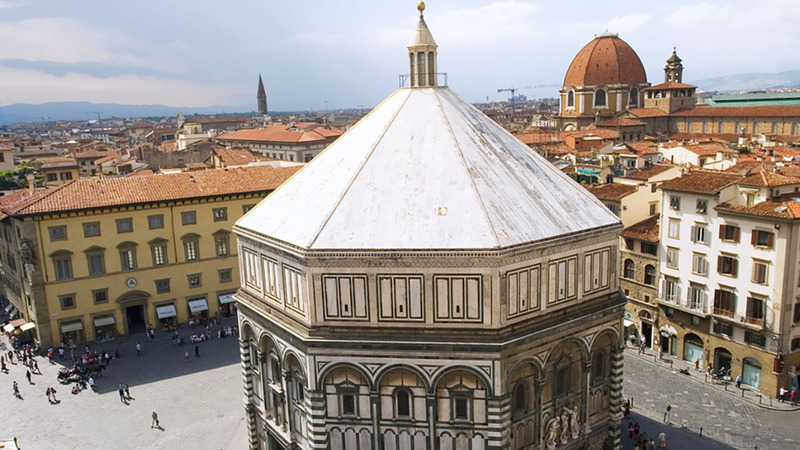 From the top of the dome you’ll enjoy the best view in Florence. 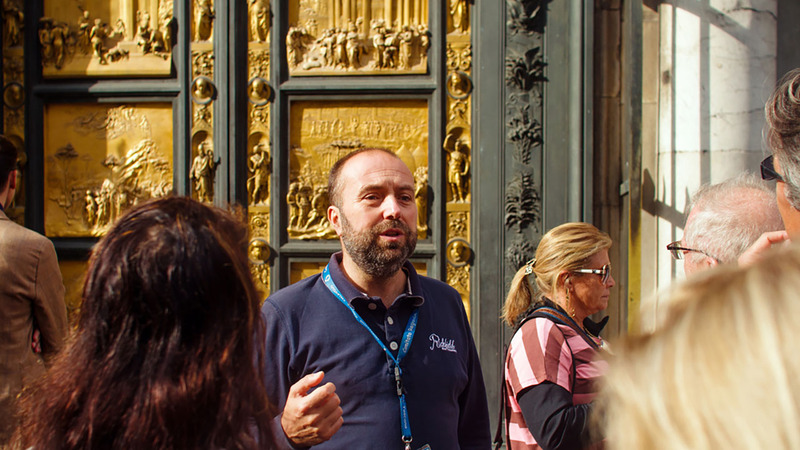 Enjoy a special access tour of the Duomo including exclusive access to the Terraces, the Duomo Museum & the Baptistery. Avoid the crowds at the Accademia on our first-entry tour, introducing you to Michelangelo’s David in relative peace. There is so much to do in Florence but two attractions stand head and shoulders above the rest: the Florence Duomo and the Accademia Gallery, home to Michelangelo’s David. With so much demand, these sites can become crowded, particularly in the summer months. We guarantee that you'll have the best experience possible on this, our most exclusive Florence tour. Combining careful timing, skip the line entry and special access, we set you apart from the crowds. Along with an expert local guide, you’ll visit extra sites usually overlooked by the public, and cross velvet ropes to get up close and personal with the two giants of Florence. Your tour starts early with a reservation for first entrance at the Accademia Gallery. Arriving before the crowds, you’ll have a little more space to explore not just Michelangelo’s David, but also his unfinished Slaves and a number of other priceless works often overlooked by visitors. Traveling in a small group of just 15 people or fewer, and with headsets for every guest, your tour will be intimate and your guide easy to question. After the Accademia it’s on to another site often (misguidedly) skipped by visitors: the Florence Baptistery. If these walls could talk, they’d tell you stories about the Medici family, all of whom were baptized here along with the poet Dante. They can’t, but thankfully your guide can. They’ll give you the inside scoop and help you decipher the beautiful gold mosaics that cover the ceiling. The most famous feature of the Baptistery is its copper-plated doors, but few visitors are aware that these are just a replica. You’ll see the real deal at your next stop, the Museo dell’Opera del Duomo (or Duomo Museum). You’ll also see Michelangelo’s other ‘Pietà’ in here, the one he created for his own tomb; along with a sculpture of Mary Magdalene by Donatello. The final leg of your visit will be inside the Duomo itself, where special access will give you more space than the average visitor. The floor of the Duomo has recently been roped off. While normal visitors circulate on paths around the walls of the cathedral, you’ll cross velvet ropes to wander the floor as you wish, getting closer to the details of the Duomo. You’ll also gain access to a special hidden room, where the Duomo stores original statues from its façade. The cherry on your cake comes last as you ascend to the Duomo Terrace for incredible views and an up-close view of Brunelleschi’s enormous dome (the largest brick dome in the world). This is incredibly exclusive access (very few visitors even know this level exists! ), with a maximum of two tour groups visiting during your time. At this level, you’ll also have access to a special door from where you can climb to the top of the Florence Duomo without waiting in line for hours. 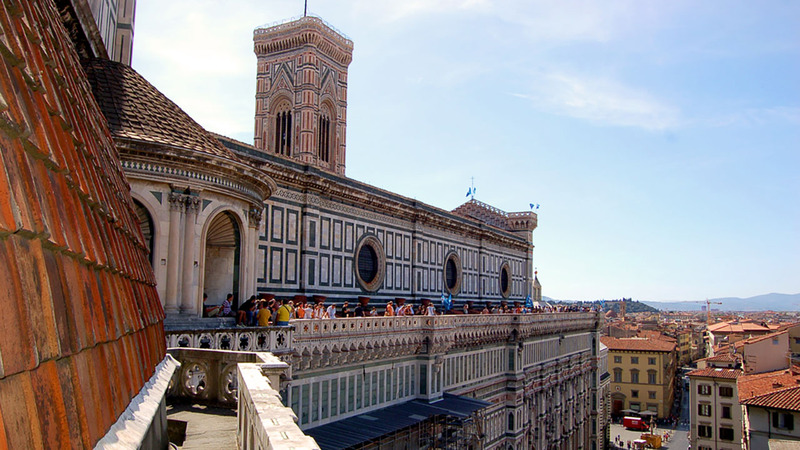 The views from the terrace are fantastic for examining Florence Duomo up close, but from the top of the dome you’ll see not just Florence, but far into Tuscany. Give yourself some time to soak up the red roofs and rolling hills; it will be a long time before you see another view quite like this. The tour was amazing and the guide very knowledgeable. Regina was a wonderful tour guide. Her knowledge of the Duomo and David was extremely detailed and interesting! She is a very friendly and welcoming person. We loved the experience and learned so much! We highly recommend this tour and especially Regina!! I was happy to book this tour on very short notice (the day before) after I had missed a tour the previous day because the meeting place was changed and no one notified me (it was not Walks of Italy). The tour was great and our guide, Ishmael, was very knowledgeable and cordial. 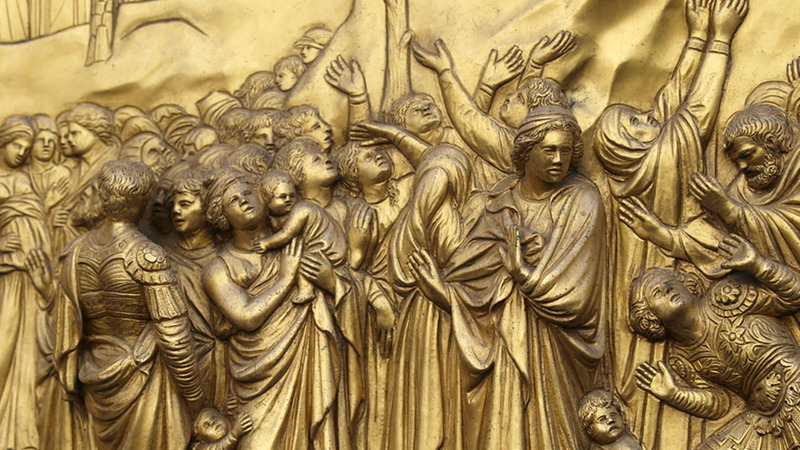 During exceptional circumstances (when there are a lot of visitors in Florence) entry to the Baptistery will require waiting in a line of up to 25 minutes. When this happens we will skip the guided portion of the tour inside the Duomo Museum and instead give guests tickets to the Museum that they can use any time in the following 3 days. We recommend going after the tour when all that your guide has told you is still fresh in your mind! As this site includes visits to religious sites, guests are asked to cover their shoulders and knees. Walks will not be held responsible for guests denied entry due to inappropriate dress. Larger backpacks are not allowed into the Cathedral and museums, please make sure to only bring small handbags on this tour. 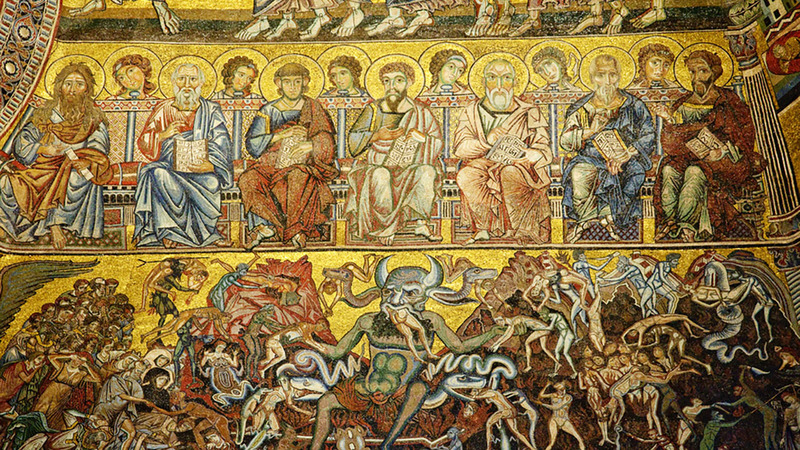 Please note that on the first Tuesday of each month the Duomo Museum is closed. On these occasions, we will include a visit of the Underground section of the Cathedral instead (Santa Reparata). We will hand you a ticket which is valid for 48 hours so you can visit the Museum on your own the following day.